The day started off gloomy, low cloud and drizzle seemed to merge with a rolling, iron grey sea whose waves were crested white. Dawn was slow to break, and came as a seeping flush of grey rather than the spectacular brilliance of gold and orange. The ferry ploughed on regardless, and for hour’s one person stood on deck blinking against the occasional drizzle and buffeted against the seemingly unerring wind. Wrapped up in warm layers, woolly hat (a Granny B special) and hood up, the hours simply slipped by in a blur of waves, rain and spray. Slowly more people joined the watch, and gradually the conditions improved. The white caps melted away leaving just dark waves behind, and while at first the clouds kept a constant cover the drizzle and mizzle disappeared. Finally after four and a bit hours, something breaks the surface. Not too dissimilar to the still constant waves, but different. Staring at the spot intently something again breaks the surface. Dolphin. A second later and the shout goes up from the back of the boat also. 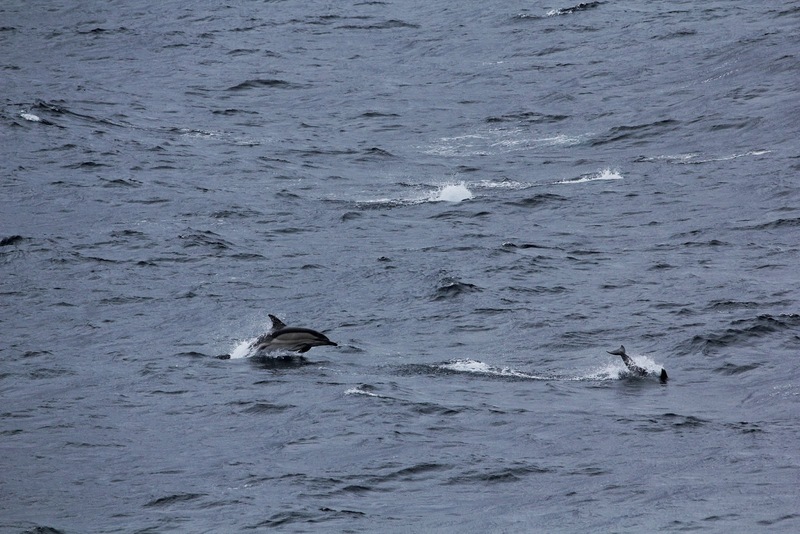 More dolphins, riding the wake the giant ferry creates. Leaping clear of the still grey waves the dolphins reveal a bright yellow patch on their flank, a sure sign these are Common Dolphins. As the morning progresses towards lunch wave after wave of groups of Common Dolphin approach the vessel, heading for the bow or passing down the side before surfing the waves of the wake. At the same time conditions improve further, glimpses of blue sky start to appear in cracks in the cloud cover. The shout of dolphin goes up again! But these are different, larger, darker and slower the group reveals itself as a pod of Long-finned Pilot Whale, surfacing close together and in synchrony, a small calf amongst their ranks. By lunch the sun is out and the sea is calm although small waves continue to ripple across the now blue water. The whales have appeared. Out on the horizon tall jets of condensed air hang like smoke against the blue of sky and water. The journey is coming to an end, ahead behind the hazy cloud I know the coastline of Spain and the dramatic edges of the Pyrenees will soon come into view. Around the ferry it looks like nothing has changed, except for the weather. But beneath us the seabed has undergone a dramatic transformation. From the deep dark depths of the abyssal plain, underwater canyons and jagged slopes have risen up, and while the water is still deep these provide the perfect conditions for fish and squid to flourish. 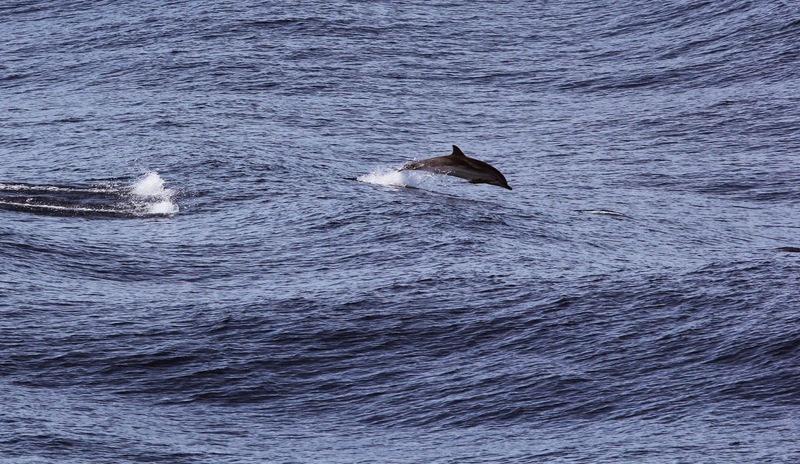 And where they flourish so does the most deep diving and elusive group of all whales, the beaked whales. Once again ahead something breaks the now blue and rippling water. But there is no leaping, no song and dance, just up, breathe, and down. Against the shimmering blue the animal is dark, but close inspection reveals a brown body, paler head and a hint of scarring. Again the animal surfaces, closely followed by a second, again it happens quickly. 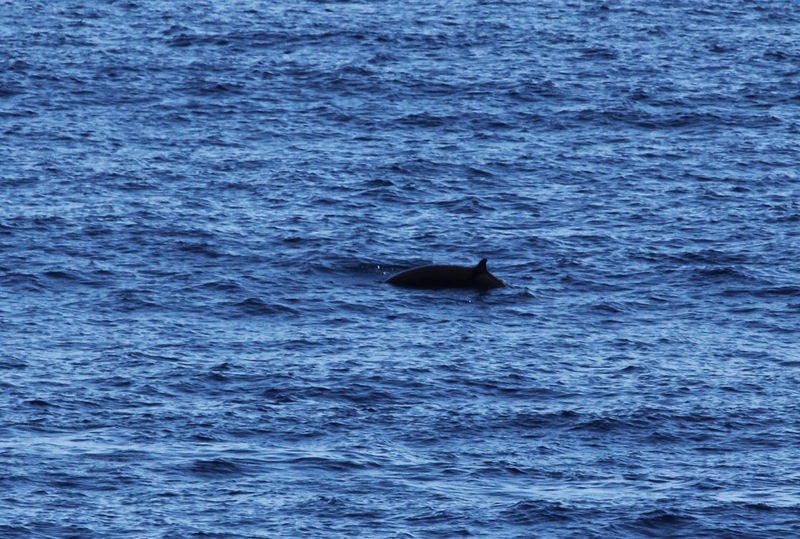 It would be so easy to miss, but to the experienced sea watcher the species is clear, they are Cuvier’s Beaked Whales. With a final fling the day is topped off with an acrobatic group of Striped Dolphin and ice cream in sunny Santander, leaving one very happy albeit tired whale watcher.